What is QE? QE stands for quantitative easing which in simple terms means increasing the money supply from the thin air. On the 13th September, Federal reserve (American central bank) announced the third QE. As per the announcement the Federal reserve will increase the unlimited money supply to reduce the unemployment and to boost the economy & growth. How does this announcement affect the Education Industry ? Well let me share the simple economic data / mechanism under which the global economy operates. US$ is termed as the worlds ‘reserve currency’ since 1944. It meant that US Govt guaranteeing other central banks that they could sell their US dollars reserves at a fixed rate of gold. As a result Japan and a few European countries devalued their currency in order to boost exports and development. On the 15th Aug, 1971 President Nixon ended the direct convertibility of the dollar to Gold. As a result the US Govt could print as many US$ required to boost the economy. In 1973 the US$ was also termed as ‘petrodollar’ meaning that all crude / oil transactions will be termed in US$ meaning ‘petro dollar’. This resulted increase in demand of the US$ in the world. Increase in prices (long term). This results in higher inflation in the world. UK pound, Canadian dollar, NZ dollar and the Australian dollar will appreciate against Indian rupee and the cost of Education will also increase in the U.K, Canada, NZ and Australia and it is due to increase in supply of US$. Indian rupee will depreciate drastically and this is due to high inflation, low GDP growth, high fiscal deficit, high debt / GDP and increase in US$ supply. Based on the above forecast the Indian students will find even more expensive to study overseas and there will be a point where the parents would prefer to invest the resources in Gold rather than Education. What next ? Is Education in India the next growth story ??? According to the innovation theory, these waves arise from the bunching of basic innovations that launch technological revolutions that in turn create leading industrial or commercialsectors. Kondratiev waves (also called supercycles, great surges, long waves, K-waves or the long economic cycle) are described assinusoidal-like cycles in the modern capitalist world economy. Averaging fifty and ranging from approximately forty to sixty years in length, the cycles consist of alternating periods between high sectoral growth and periods of relatively slow growth. Unlike the short-term business cycle, the long wave of this theory is not accepted by current mainstream economics. Now the question is what is the next big wave ? To understand the outcome one must agree to the fact that we are at a recession period where in the Government’s expenditure outnumbers the Government’s income for most of the developed and developing nation. In addition, the Government is printing more fiat currencies to keep the interest rate low. India is probably one of the first countries to recover from the recession. Watched like a hawk by the Reserve Bank of India (RBI), India could avoid excessive leverage and mortgage defaults, and hence went into recession with lesser burden. This also helped it recover faster. Demographers say the emerging world will stay young while the rich world ages. In 2020 the median age in India will be 28, compared with 38 in America, 45 in Western Europe and 49 in Japan. These factors will come into play in the shift of power from West to East in the next 40 years in the world. A rising young population, if proper skilled, can transform the economy with higher earnings, savings and investments. The urban population will double from the 2001 census figure of 290 million to perhaps 590 million by 2030. India has to spend USD 1.2 trillion on urban infrastructure, or at eight times today’s rate. But the question is how will India grow? Companies in India will need to have skill manpower to compete in the Global world. India has skill shortages and developed nations have the technique / intelligence to develop these skills. Hence, I am of a firm view that any University / Vocational training institute which takes the lead in developing skills by collaborating up with the Indian Industries in India will surely gain not only monetary success but also will be able to ride the wave with great success. Just recruiting students from India as a strategy is now outdated. It’s time for the Overseas Education providers to think out of the box and enter the growth stories of India as an engine of future growth. The Changing Trend….the future enrollments…. As I try to find the answer to the basic question on the future enrollments, I have come across to interesting facts / figures which is an eye opener for me. • The top institutes, a majority of the 4,000-odd management institutes in India are facing an acute shortage of students, even a 50% drop in some cases,” says IIM Calcutta director Shekhar Chaudhuri. • US-based Graduate Management Admission Council (GMAC), GMAC said while 2,58,192 students took the exam globally in 2010-11, the number of applicants was higher, at 2,63,979 in 2009-10. The number of Indians who took GMAT fell to 25,394 in 2010-11 from 30,633 in 2008-09. • Some Indian management institutes are planning to lower their rigorous selection criteria for the next academic year to fill the seats, and are considering a relaxation in percentage cut-offs and a larger selection list. • Global recession is forcing engineering students – one of the largest section of MBA aspirants – to go in for jobs immediately after graduation. Working executives are also thinking twice before pursuing an MBA. • Most of the mid / small size Indian industries are joining hands and are recruiting students from the Indian campus before they even finish their courses. • There has been very positive growth in the employment market in India during the first quarter of 2011 with considerable recruitment activity taking place. A wide number of vacancies exist in a range of sectors including IT, banking, government, postal and telecoms, engineering, medical, financial, insurance and automobile. Based on the above facts it is very clear that an Indian student finds it easy to secure a job after completion of course and this is a new trend due to the economic activities around the country. Recently, I had a privilege of having a chat with a Director of a prominent Education provider offering Education across various faculties. The recent Economic down turn and a conservative migration policy of various Governments have put many Education providers to scratch from the basics and draw a blue print on the way forward. During the interaction I was informed that a few Education providers are planning to reduce number of courses and reduce number of representatives which will indirectly reduce their overall costs. Always inquisitive my instant reaction was as to how this will reduce the cost? Though I did not receive a convincing answer and hence I thought let me put my feet in their shoes and try to find a convincing answer which catches the expectations and bottom line at the end of two years from now. The phrase the Long Tail was first coined by Chris Anderson. Anderson argues that products in low demand or that have a low sales volume can collectively make up a market share that rivals or exceeds the relatively few current bestsellers and blockbusters, if the store or distribution channel is large enough. Where inventory storage and distribution costs are insignificant, it becomes economically viable to sell relatively unpopular products; however, when storage and distribution costs are high, only the most popular products can be sold. For example, a traditional movie rental store has limited shelf space, which it pays for in the form of building overhead; to maximize its profits, it must stock only the most popular movies to ensure that no shelf space is wasted. Because Netflix stocks movies in centralized warehouses, its storage costs are far lower and its distribution costs are the same for a popular or unpopular movie. Netflix is therefore able to build a viable business stocking a far wider range of movies than a traditional movie rental store. Those economics of storage and distribution then enable the advantageous use of the Long Tail: Netflix finds that in aggregate, “unpopular” movies are rented more than popular movies. I have tried to venture the long tail theory in the Education Industry. Just as the traditional warehouse store’s inventory is limited to the walls that contain such goods, the traditional on site academic institutions / colleges course catalog is limited by similar constraints like classroom space, faculty and course development expenses. For a warehouse store it means less prospective sells and for the on site academic institution means lower potential enrollments. Which also means that academic institutions / Universities / colleges must offer wide variety of course catalogs to expand its enrollment numbers. Any strategy of just focusing on a few courses or few Education representatives will deprive the students and many thousands of students will shift to the colleges and Universities searching for niche courses. Universities / colleges offering more diverse courses (i.e social networking administration, green business management, contemporary mathematics and so on) will be found more often online, making those Universities / colleges more competitive which will ultimately lead to more enrollments. The same principal applies in appointing Education representatives by the Education provider. More the Education reps will ultimately lead to more enrollments and numbers. I now explore the impact on the Education representatives while exploring the opportunities for the Education providers and its representatives. Just as the traditional warehouse store’s inventory is limited to the walls that contain such good, the Education representative offering few Education providers or a few courses will lead to lower potential enrollments. Hence, the strategy of marketing only a few courses or a few Education providers will enroll fewer students to the Education providers in long run. Hence, to catch the niche market the Education representative will have to expand its base and offer more courses with diverse Education providers in different geographical regions. So how can an Education provider or the Education representative can increase the enrollment numbers without increasing the infrastructure and fixed costs. The answer is simple and that is web based courses for the Education provider and web based marketing for the Education reps who actively promote on the web. I am quiet amazed to read the number of certificate / online courses offered by http://gatlininternational.co.uk/catalogue Gatlin International are web based Education providers since 1994. Their courses have a niche market and their combined enrollments are more than the regular and popular courses. Time has come to change the mindset and re investigate the strategy before using the resources. Internet / web offers unlimited potential and in a flat world the niche / demand will keep changing with the economic scenario and one needs to be vigilant at this stage. My next blog Generation 3.0 will explore on the new world frontiers where we all are connected directly or indirectly and the world is emerging as a one big market. 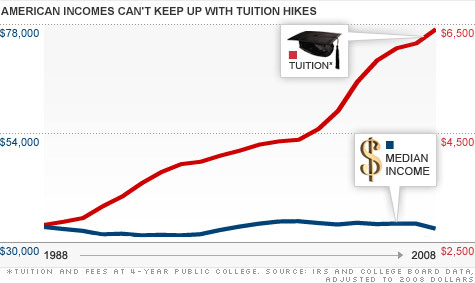 Is higher Education a bubble or is it too expensive in this economic scenario?? Recently in the higher education segment, I have witnessed strategical developments which were unthinkable couple of years ago. This academic year Gujarat University for its Bachelors of Commerce students introduced a subject not even a topic but a full subject of 100 marks known as “Tally”. We all know that in Indian subcontinent Tally is popular accounting software which provides accounting solutions to approximately 20 lakh (2 million) small and mid segment companies. Till now Tally was taught as a vocational subject and today it is offered to degree students. Technically the trend should be that new innovations are taught at degree level and vice versa. However, here we can clearly see that contents of vocational courses are taught at a degree level to boost the employment after graduation. My second observation is of L.D Engineering college which is a premiere institution offering Engineering courses in Western India. Till now it was a competitive struggle to secure admission at this premiere Engineering college. But this year there are approx 20% empty seats and I did a brief survey and found that most of the students are inclined to study short term courses leading to employment. There is strong view amongst the students that on completion of 4 years of degree we may be outdated as the industry progresses faster than the academic developments. Both these incidents forced me a further investigate as to whether high education courses are in a bubble or are they too expensive in this economic scenario. In 1988, the average tuition and fees for a four-year public university rang in at about $2,800, adjusted for inflation. 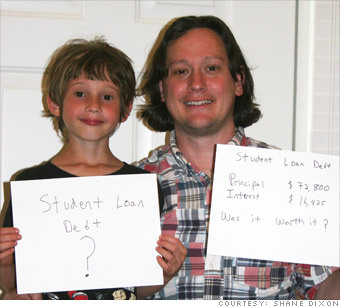 By 2008, that number had climbed about 130% to roughly $6,500 a year — and that doesn’t include books or room and board. 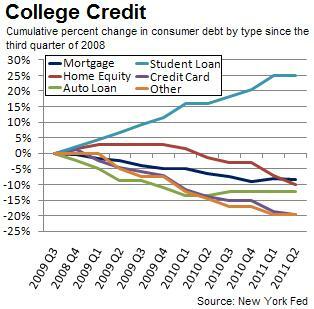 Here you can clearly see that the student loans are on a rise and for an American consumer repayment towards the student loan and mortgage comprises of 70% of their expenses. Students today are now paying for a larger share of the benefit they receive. In the current economic scenario failure of the education system (higher education) to offer employment to large chunk of population is a challenge. The buzz word in New Delhi is to offer vocational training which leads to employment. To an extent one can say that higher education has gotten too expensive as the tuition fees invariable goes up every year and at the same time for certain pocket markets higher education is a bubble which will be corrected soon.